Acne, a scourge of adolescence, may be about to meet its ultra high-tech match. 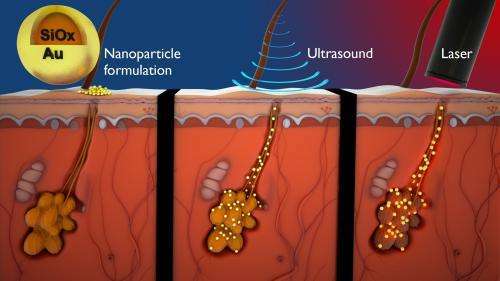 By using a combination of ultrasound, gold-covered particles and lasers, researchers from UC Santa Barbara and the private medical device company Sebacia have developed a targeted therapy that could potentially lessen the frequency and intensity of breakouts, relieving acne sufferers the discomfort and stress of dealing with severe and recurring pimples. "Through this unique collaboration, we have essentially established the foundation of a novel therapy," said Samir Mitragotri, professor of chemical engineering at UCSB. Pimples form when follicles get blocked by sebum, an oily, waxy substance secreted by sebaceous glands located adjacent to the follicle. Excretion of sebum is a natural process and functions to lubricate and waterproof the skin. Occasionally, however, the openings of the follicles (pores) get blocked, typically by bits of hair, skin, dirt or other debris mixed in with the sebum. Overproduction of sebum is also a problem, which can be caused by hormones or medications. Changes in the skin, such as its thickening during puberty, can also contribute to follicle blockage. Whatever the cause, the accumulating sebum harbors bacteria, which results in the inflammation and local infection that we call acne. The new technology builds on Mitragotri's specialties in targeted therapy and transdermal drug delivery. Using low-frequency ultrasound, the therapy pushes gold-coated silica particles through the follicle into the sebaceous glands. Postdoctoral research associate Byeong Hee Hwang, now an assistant professor at Incheon National University, conducted research at UCSB. "The unique thing about these particles is that when you shine a laser on them, they efficiently convert light into heat via a process called surface plasmon resonance," said Mitragotri. This also marks the first time ultrasound, which has been proved for years to deliver drugs through the skin, has been used to deliver the particles into humans. These silica and gold particles are exceedingly tiny—about a hundredth of the width of a human hair—but they are key to the therapy. Once the particles are deposited in the target areas, lasers are aimed at them and, because the gold shells are designed specifically to interact with the near-infrared wavelengths of the lasers, the light becomes heat. The heated particles essentially cause deactivation of the sebaceous glands. The sebum, pore-blocking substances and particles are excreted normally. "If you deactivate these overproducing glands, you're basically treating the root cause of the acne," said Mitragotri. According to the research, which is published in the Journal of Controlled Release, this protocol would have several benefits over conventional treatments. Called selective photothermolysis, the method does not irritate or dry the skin's surface. In addition, it poses no risk of resistance or long-term side effects that can occur with antibiotics or other systemic treatments. "It's highly local but highly potent as well," Mitragotri said of the treatment. "I think this would be beneficial in addressing the concerns regarding other, conventional treatments." According to Mitragotri, this photothermolysis method is particularly suited to patients with advanced, severe or difficult-to-treat acne. The research has gone from concept to clinical trials in a relatively short amount of time. However, other more long-term elements of this therapy have yet to be studied, such as the extent of follicular damage, if any; what the most effective and beneficial parameters of this treatment may be; and what contraindications exist.